This really does make a delicious cheesecake. You may need to adjust the baking time to a little bit longer. I had to add an additional 20 minutes to this. What makes Lindy's Famous Cheesecake so different? This cheesecake does not have a graham cracker crust. In a medium bowl, combine flour, sugar, lemon zest and vanilla. make a well in the center and add egg yolk and butter. Mix until dough pulls away, and cleans, sides of the bowl. Remove from bowl, form into a ball, wrap in waxed paper and refrigerate for 1 hour. Preheat oven to 400 degrees and grease the bottom and sides of a 9-inch springform pan. Remove side from pan and set aside. Roll 1/3 of the dough to fit the bottom of the springform pan, place in the oven and bake until golden, about 8 - 10 minutes. Remove and set aside. Divide the remaining dough into 3 parts and roll into strips 2 1/2 inches wide and 10 inches long. Put springform back together, leaving baked crust in pan. Fit dough strips to side of the pan, joining ends to line pan completely. Trim dough so it comes only 3/4 inches up the side of the pan. Refrigerate while making the filling. FILLING In a large mixer bowl combine cream cheese, sugar, flour, lemon zest, orange zest, and vanilla. Beat, at high speed, until just blended. Reduce to medium speed and add eggs, and yolks, one at a time. Add cream, beating until just combined. Transfer mixture into springform pan. Bake 10 minutes, at 400 degrees, reduce heat to 250 degrees and bake 1/2 hour longer. Remove and let cheesecake cool completely on a wire rack. Refrigerate 3 hours to overnight (better) before serving. 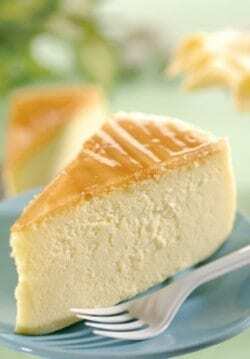 Its very delicious cake thanks for sharing cheesecake recipes. fantastic taste but why did it rise and fall and then crack. delicious anyway and i covered the ugly top with fresh berries. This was really good! I loved the flavor that the Lemon and orange zest added!